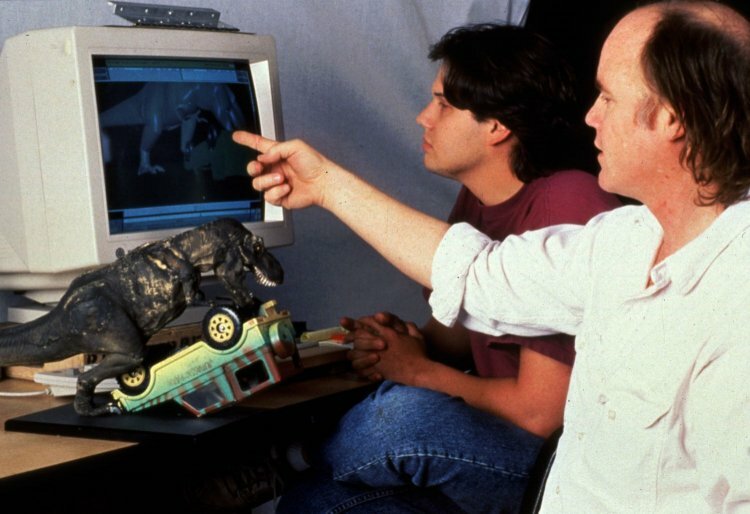 In late 1991, when Phil Tippett and his colleagues at Tippett Studio (Berkeley, CA) began thinking about the stop-motion animation they expected to do for their next big movie, they had no idea that the movie, Jurassic Park, would instead signal the end of traditional stop-motion animation at Tippett Studio. “We were talking about how we`d have to build new rigs, how we’d expand,” says Jules Roman, producer and co-owner of Tippett Studio along with her husband, Phil Tippett. “But meanwhile, Dennis Muren at Industrial Light & Magic had been working in CG and showed a test shot to Steven [Spielberg]. Little did he know that in approximately five years he would describe his studio as 99.99% dependent upon computer graphics; that by August, 1997, Tippett Studio would have completed a 2 1/2 year-long movie project in which all the character animation would be created with CG. That movie, Paul Verhoeven’s Starship Troopers based on Robert Heinlein`s novel, is scheduled for release this fall. Phil Tippett began his career in visual effects with George Lucas` Star Wars, released in 1978. In 1983, he became head of the Lucasfilm creature shop and won an Academy Award for his work on Return of the Jedi, which included the memorable character “Jabba the Hut” and other aliens. In 1985, he founded Tippett Studio, which created creatures for a string of movies, including Willow, resulting in an Academy Award nomination, Ghostbusters 2, all three of Paul Verhoeven`s Robocop movies, and Honey, I Shrunk the Kids. As it turned out, Tippett was to play a large role in Jurassic Park as well and would ultimately share an Academy Award for that movie. Fortunately, Craig Hayes, art director and visual effects supervisor at Tippett Studio, had been working on an armature device to feed stop-motion animation data into Softimage’s 3D animation software. And Dennis Muren was interested in keeping Tippett involved in the project. The Dinosaur Input Device, or DID, as the armature came to be called, was used for 15 of the 52 computer animation shots in Jurassic Park, including the road sequence in which the T-Rex attacks the tourists` jeep and the kitchen sequence in which the two velociraptors hunt the children. Around the time Jurassic Park was playing in movie theaters, Tippett received the first screenplay for Starship Troopers. It was time to make the big transition to computer graphics. The 15-person crew that worked on Jurassic Park grew to around 30 people when the studio got a contract to create two CG sequences for the movie Three Wishes. “It was a very quiet movie,” says Roman, “but it gave us a fantastic opportunity to get our CG legs.” Meanwhile, they began working on tests for Starship and began hiring people–eventually tripling in size. The final “test” was an eight-shot mini movie directed by Paul Verhoeven. “After that, we felt pretty confident we could do the production we had been doing but with the computers,” says Hayes, who has been with the studio since its early days. For Starship Troopers, Tippett Studio designed all the creatures, which are giant bugs, and created all 218 creature shots. (Other studios, Sony Pictures Imageworks, ILM, and Boss Film, worked on spaceship effects.) “This is like a World War II movie,” Hayes explains. “The bugs are the enemy.” Nine-foot-tall warrior bugs that resemble scorpions are the generic ground troops, mosquito-like “hoppers” function as an air force, and big tanker bugs that look like beetles act as battering rams. In addition, a 10-story-tall bug launches the bug-equivalent of rockets, and an evil brain bug does unspeakable things to its enemies. “No matter what you do to them, all they want to do is kill you,” says Jeremy Cantor, an animator who worked on the brain bug. “They don’t think. They just kill.” What do they kill? Humans. As is typical in most CG effects studios, the production pipeline includes modelers, painters, animators, technical directors for lighting and rendering, rotoscopers, and compositors. The design process starts in the art department–Hayes` territory. Here, the modelers and painters create the drawings, build the maquettes, digitize the maquettes to create 3D models, and paint texture maps. They built their own 3D digitizer, but they use standard commercial software for modeling and painting: Softimage 3D from Microsoft Softimage (Redmond, WA), Amazon 3D Paint from Interactive Effects (Tustin, CA), and Photoshop from Adobe (Mountain View, CA). What`s unusual is that all the modelers and painters have come from traditional backgrounds; none had any CG experience before being introduced to computers at Tippett Studio. “We`ve made a specific effort to get people who have production experience or movie experience, and who have done real sculpture, real painting, real mold-making. I would consider it a deficit if somebody didn`t have that experience,” Hayes says. Nor are their animation techniques always typical of a CG effects studio. Fifteen of the animators worked entirely within Softimage, but four of the animators used a new DID (now called a “Bug Input Device”) for stop-motion animation and to do real-time puppeteering. “Originally the DID was only going to be used for stop motion, but I realized if we just loosened the joints and put some springs on it to make it flex and bend, we could get into real-time animation,” says Stokes. Stokes worked on one of the first real-time CG animations, “Mike the Talking Head,” with performance-animation pioneers Michael Wahrman and Brad DeGraf, and later helped puppet the alien in the movie Species at Boss Film. He and Tippett found the real-time DID helpful for previsualization as well as for final animation. “Phil and I used the DID to do some early tests, and while we were messing around we improvised a move that became a signature move for the warrior bugs,” says Stokes. The DID was created for only the warrior bug since that creature accounts for the bulk of the animation. In one scene, for example, 700 warrior bugs storm the barricades. “That scene was done with a combination of techniques,” says Cantor. “We would do 20 or 30 very long walk cycles and apply those to the 700 bugs.” By adjusting the motion curve slightly for each bug`s cycle, they could make sure no two bugs would be doing the same thing at the same time. Using Alias/Wavefront`s (Toronto) Dynamation software, they would set up motion paths on the terrain, put one cycle on each path, then set up a force field for the objects. That motion would then be moved into Softimage where it could be tweaked if needed, according to Doug Epps, CG Supervisor. With a similar goal in mind, that of tweaking the procedural animation for a scene in which some of the walking warrior bugs needed to look as if they’d been bombed, Stokes wrote a little program that let him blend real-time puppet animation with procedural animation. The foreground bugs in the battle scenes were all animated within Softimage, adding a third method of CG animation. “In one shot there were 90 bugs done by hand by three animators, and behind those bugs were another 600 or 700 in the background done procedurally,” says Cantor. This mixture of animation techniques seems only natural to Tippett. “If you have talented computer graphics animators at your disposal, you let them work with the tools they know; if you have stop-motion animators, give them the tools they’re familiar with; if you have decent puppeteers, give them some real-time puppeteering stuff. We want to let every craftsperson work in the milieu that’s the most familiar,” he explains. The sense of creating a studio that still has a flavor of an artisan`s workshop rather than a data-processing factory is important to Tippett and Hayes, who remain somewhat uncomfortable with computer technology even though they acknowledge its advantages. Tippett agrees that the editorial capability is the main benefit of CG, but close behind is the elimination of physical constraints. “Now we can manipulate the physical world with a plasticity that a painter has in the two-dimensional world. It isn`t just the change in working methods that bothers Tippett; an attitude change concerns him as well. “I`m beginning to see a tendency, particularly with people from a computer-graphics perspective rather than a craft- or art-driven perspective, to live in a world where there`s no relationship to consequences,” he says. “They think you can always fix something. You can always change it, edit it. So when your $80,000 piece of junk that you just bought blows up, they just accept it. They don`t get angry. “I really don`t like it,” Tippett continues. “When anyone is performing in real space, there`s a relationship to everything in the world around him. The architecture and certainly the light and shadow play a great deal into one`s awareness into how one moves, and to not have a shadow–it`s like Peter Pan or something. How do you know what the best dramatic highlight is? The picture-making knowledge Tippett and Hayes have to offer is one of the things that drew animator Cantor to Tippett Studio. “It`s great to be in a place where this 45-year-old legend of the industry walks over to your desk and goes, `Not like this, like this,` and physically acts out a warrior bug attack. I`m a much better animator than I was a year ago,” he says. This entry was posted in Friday Flashback and tagged #JurassicPark, #StarshipTroopers, #TippettStudio, Friday Flashback, SOFTIMAGE|3D by xsisupport. Bookmark the permalink.